Once a year in the Cuzco region of Peru, the former center of the Inca empire, some 50,000 pilgrims flock to the highest sanctuary of the world to participate in the largest pilgrimage of the Andean region. The sanctuary of the Señor de Qoyllur Rit’i (Lord of the Shiny Snow) is located nearly 16,000 feet above sea level, at the foot of the Qollqepunku glacier. Traditionally, pilgrims walked from their towns performing their music and dance to visit this miraculous image of Christ on a rock. Today, however, most pilgrims reach the area by truck or bus and only hike uphill the final five miles to reach the sanctuary. The pilgrimage combines longstanding Andean principles and practices and those brought into the tradition by Catholicism. This insightful and beautifully filmed documentary focuses on the comparsas or dance troupes from the community of Pomacanchi, Cuzco, that continue the tradition of walking all the way to the sanctuary, covering 85 miles up and down mountains in three days and two nights, accompanied by the incessant music of flutes and drums. After another two-and-a-half days and two nights at the site, where they perform their ritual dances and participate in an unremitting musical experience, these Quechua-speaking pilgrims return home and leave the site deserted. The film deftly interweaves footage from three separate pilgrimages in which the filmmaker participated to provide a close and detailed depiction of the pilgrims’ experiences and explore the importance of the unity of sound, sight, and movement to the construction of meaning and memory to them. 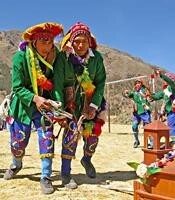 Since Quechua-speaking Andeans best learn and remember through the integration of the three, their dance, music, and religious festivals are shown to be central to their social reality. In addition to its remarkable depiction of the long and profound journey to the sanctuary, the film also includes scenes of important activities in the community of Pomacanchi before and after the pilgrimage, as well as remarkable footage of the ceremonial rituals at the sanctuary. Colorful, intense, and absorbing, The Pilgrimage to the Sanctuary of the Lord of Qoyllur Rit’i will generate thought and discussion in a wide range of classes in Latin American and Andean studies, cultural anthropology, comparative religion, and ethnomusicology, and will be essential for any class studying pilgrimage traditions, religious practices, and indigenous performances in the Americas. It was produced by Zoila S. Mendoza, a Peruvian anthropologist and Professor of Native American Studies at the University of California, Davis.